A long time ago, shortly after I first began carrying a gun, I wore a pistol inside my belly band during a solo car trip out of town. Feeling drowsy in the late afternoon when I was still several hours away from home, I pulled over in a safe place and tilted my seat back for a nap. When I woke up a few minutes later, my pistol had somehow wormed its way out of the belly band’s pocket, and was lying on my stomach, completely outside the belly band. Yeah. The sight of my gun’s unprotected trigger didn’t exactly give me a warm fuzzy feeling. Here’s what I learned in that horrifying moment: If you have a gun holder that squishes when it gets squeezed, you need a retention strap. No exceptions! Whether it’s a belly band or a thigh holster, a purse compartment or an ankle holster or some variant of a shoulder holster, every squishy gun holder should have a way to keep the gun securely where it’s supposed to be. Safety Tip: You MUST use a retention device with every soft, pliable gun holder. Why? Because when you move around, a pliable gun holder can – and eventually will! – squeeze the gun out of its place from the bottom up, just like squishing toothpaste out of a tube. 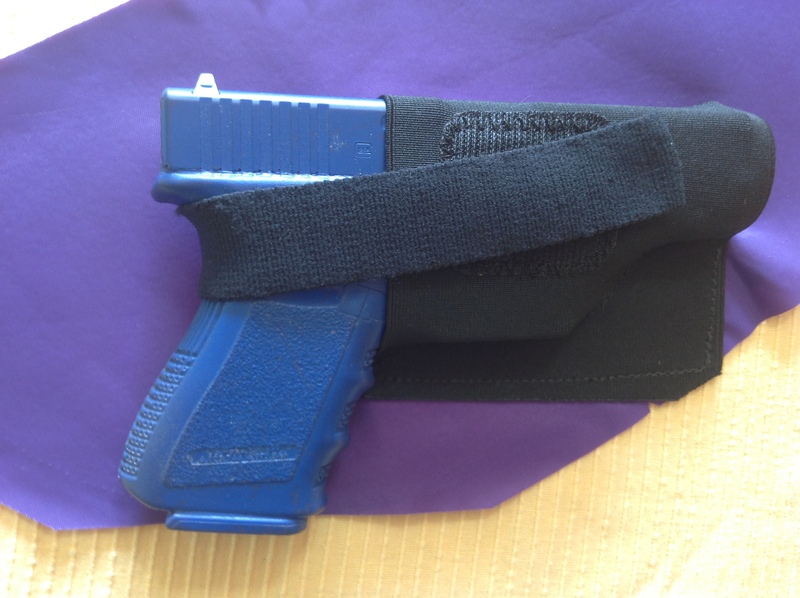 Putting a retention strap over the gun when you wear a soft holster is just like putting the cap on a tube of toothpaste before you put it in your suitcase. It prevents a mess most people would rather avoid. Of course, not everyone loves retention straps. In fact, some manufacturers, most notably the belly band makers, just haven’t gotten the memo yet. Here’s a quote from one belly band maker I met during the NRA show: “Oh, people hate getting tangled up in those things, and they don’t know how to use them anyway.” That’s why this belly band maker (who otherwise has a very cool product) does not offer retention straps with her products. Another maker told me that he saw no point in “fighting the market.” He said, “People want products without straps, so that’s what we sell. They’re just too confusing for people to use.” Hmmm. Personally, I want a product that holds my gun safely and securely all the time, so that I can trust it in everyday use. But maybe that’s just me. Even makers who do provide retention straps don’t always tell people how to use the darn things. (Maybe they don’t always know, themselves.) You open the package and there’s – what? A holster/pouch/gun holder thing, a strip of elastic, and nothing else. Oh, maybe a lawyer disclaimer or something. But no instructions. 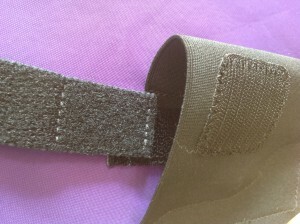 Some squishy gun holders, such as one brand of ankle and thigh holsters popular among some women’s shooting groups, actually feature very badly-designed retention straps that are almost impossible to use (they pretty much force the user to put the strap directly over the grip, and to use both hands to untangle the strap and free the gun). A lot of people simply cut off those straps because they don’t work well, and don’t realize how much safety they’ve just given up by removing the strap. Fortunately, there’s an easy fix for that, too: go ahead and cut those badly-designed straps off, then add some Velcro and use an elastic strap like shown below. When I come across a squishy gun holder that doesn’t have a retention strap, before I’ll use it, I simply take ten minutes to add this essential safety feature. If the strap isn’t designed to work well, I cut it off and install my own. It isn’t a lot of work and it isn’t at all hard to do. Even someone with non-existent sewing skills (that would be me!) can do it. The pictures below show the best and easiest way to use an elastic retention strap. No, really. Best and easiest. You’re not going to believe it. Whenever I demonstrate this little trick in one of my classes, the students often break out in spontaneous applause. 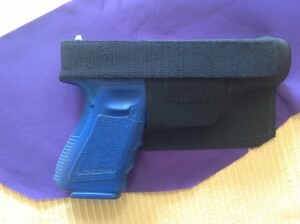 This type of strap works very well with soft, pliable gun holders. It comes standard inside Galco purses, 1 and it’s very easy to make your own. When you make your own, all you need is one strip of elastic and two squares of Velcro. It takes about ten minutes to sew the patches in place, and then you’re done. Ingredients: soft, squishy holster, elastic strap, and a gun-shaped object. Most people instinctively install the strap this way. THIS IS WRONG. Even though it’s very natural to put the strap directly over the grip, it’s also … not good. With the strap there, it’s almost impossible to draw the gun because the strap is riding where your hand is supposed to go. Did I mention that putting a strap directly over the grip keeps you from easily drawing the gun? Close up of squishy holster. Notice the orientation of the Velcro. 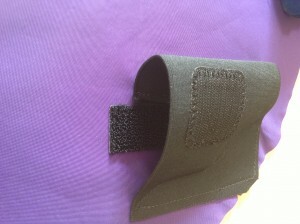 Here’s a closer look at the Velcro on the holster. Notice that there are two Velcro patches — one inside and one outside the holster. 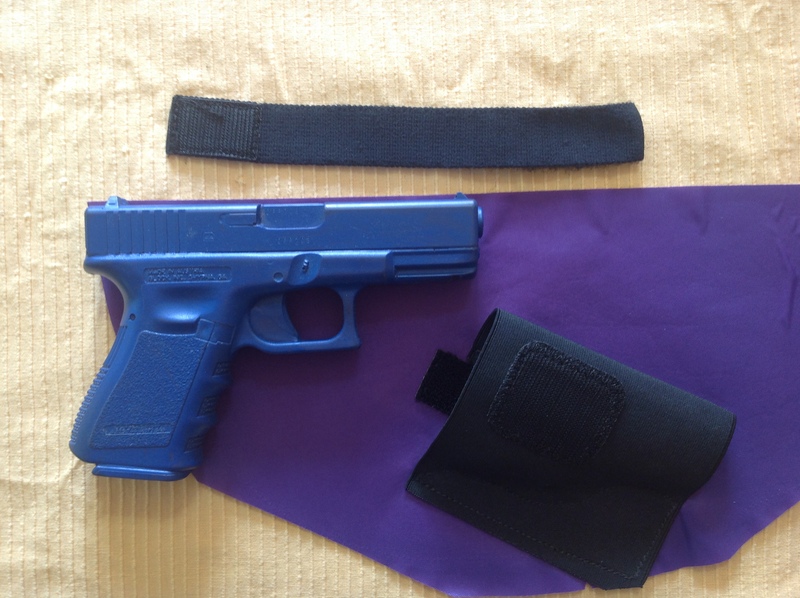 As you will see, the patch inside the holster is absolutely vital for making this trick work. It can’t be too deep inside there, either. Marry the end of the elastic strap to the Velcro patch inside the holster, then smooth it down firmly. When you put the elastic strap in place, don’t put it too deep into the pouch. It should be shallow enough that you can shove through it with your thumb while you’re gripping the gun. The strap goes over the back of the gun, above the grip so you can easily get your hand on the gun. Stretch the elastic a little to give it some tension. The tension provided by the elastic isn’t just for looks. Again, it’s a vital part of making this trick work. 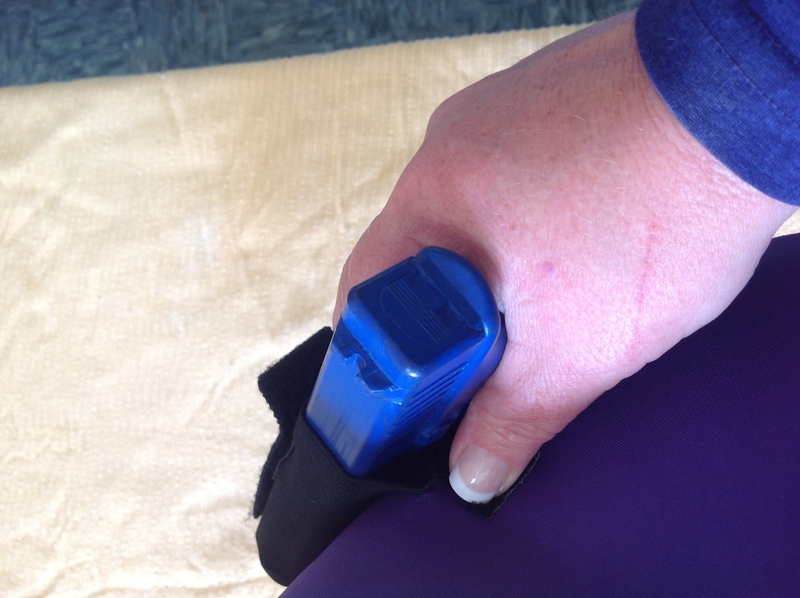 As you grip the gun to begin your draw, drive your thumb into the Velcro on the thumb side of the gun. The elastic strap will naturally flip out of the way. When you’re ready to draw the gun, simply put your hand on the grip. As you grip it, drive your thumb into the Velcro mating on the side of the gun, and the elastic strap will neatly flip out of your way. Disclaimer: The author of this site assumes that you are an adult human being capable of making your own choices and taking responsibility for same. If you are not an adult, or are not capable of taking responsibility for your own choices, STOP. Do not read anything else on this site. The author has made a reasonable, good-faith effort to assure that the articles herein are accurate and contain good advice, but hereby advises the reader that the author is a normal human being who makes the normal number of human mistakes. Deal with it. If it sounds stupid to you, don't do it. The author accepts absolutely no responsibility whatsoever for anything you might say or do as a result of reading any material on this site. Live your own life.